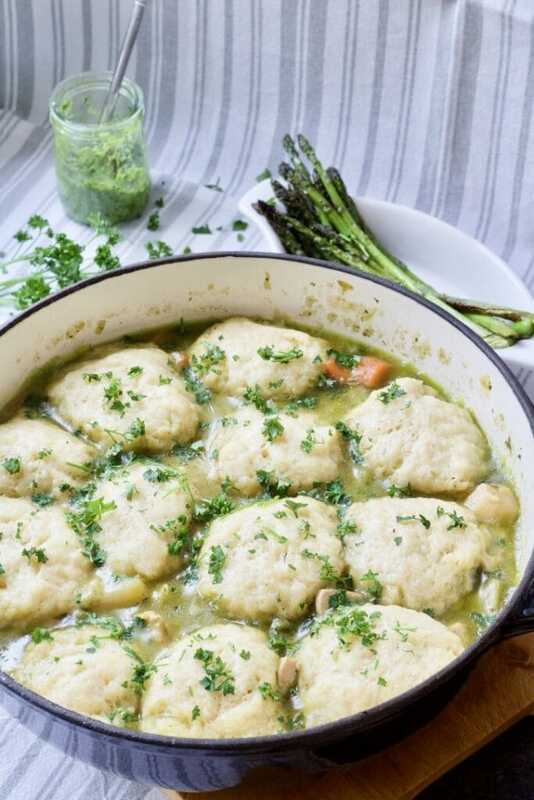 This Wild Garlic Chicken Stew with Cheesy Dumplings is packed full of veg & uses delicious and seasonal wild garlic pesto. Wholesome, tasty, full of flavour! 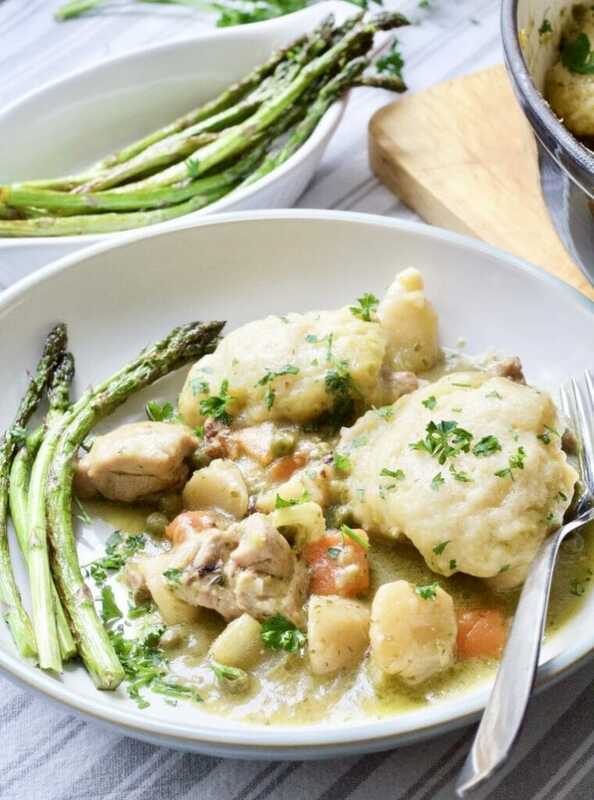 This hearty chicken stew with most delicious cheesy dumplings is no diet food! It is, however, super wholesome and packed full of veg and with lovely wild garlic pesto giving it that fresh, spring flavour. 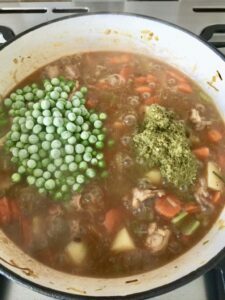 This stew is worth every single calorie , I promise you that! 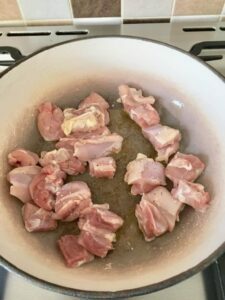 This recipe is relatively quick as stews go due to the use of chicken thighs and also uses one pot only which is a bonus. 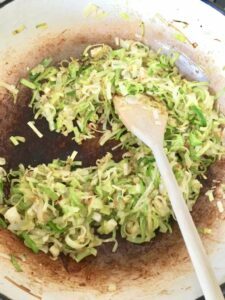 You will need to make your food processor or a bowl dirty in order to make dumplings but that’s it. 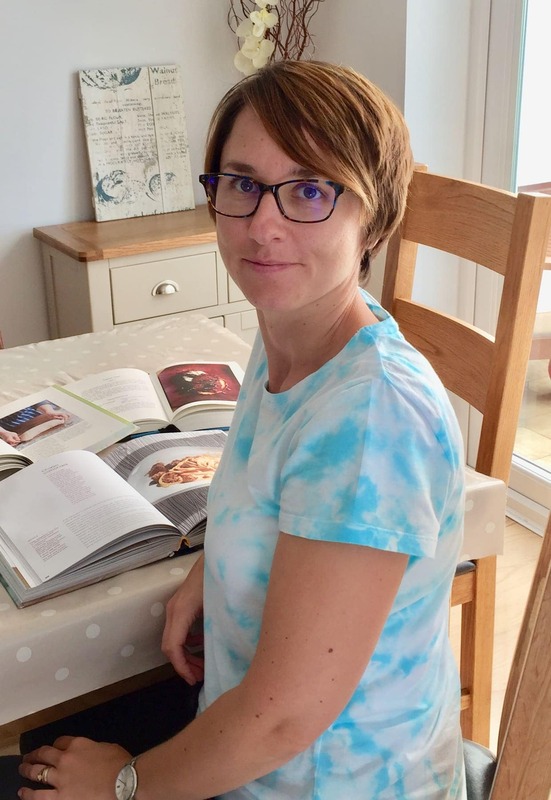 If you follow the blog you know that I have been a little bit besoted with wild garlic this season and have been enjoying it in many different recipes from Wild Garlic Hummus, through Wild Garlic & Walnut Pesto to Roast Chicken with Wild Garlic Pesto & Shallots. What if I don’t have wild garlic pesto? 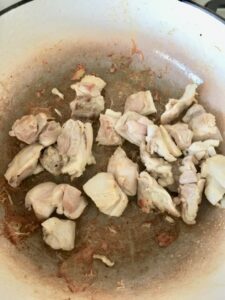 Can I still make this chicken stew? 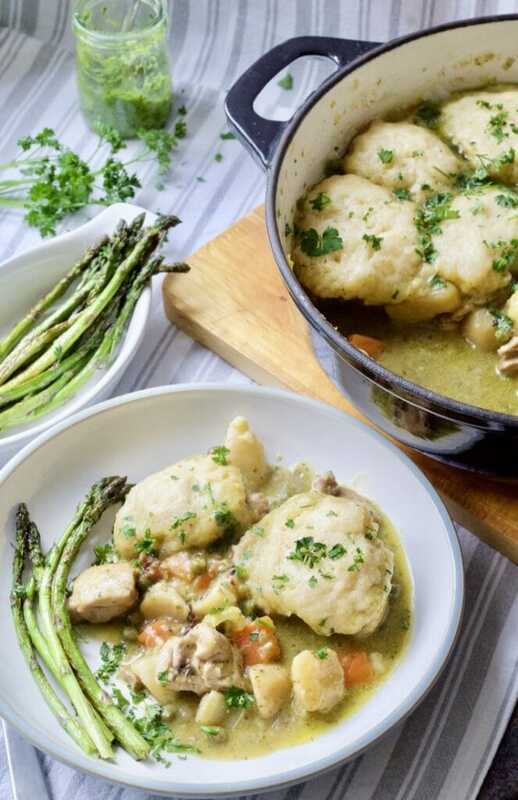 This Wild Garlic Chicken Stew with Cheesy Dumplings uses my wild garlic and walnut pesto but feel free to use any pesto that you’ve got available as I am aware that wild garlic might be a bit difficult to come by. However, I would definitely stick to green type of pesto as opposed to red (roasted pepper) one as it’s got more of a Spring/Summer feel to it. When taking my step-by-step photos to update this recipe I have used regular basil pesto. 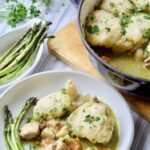 Wild Garlic Chicken Stew with Cheesy Dumplings – Serving Suggestions! 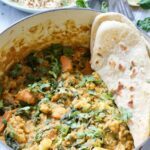 As it’s a one pot dish packed full of veg, this lovely stew doesn’t really need anything to go with it but serving it with a side of seasonal veggies like purple sprouting broccoli or season’s first asparagus will not go amiss. Any green veg, in fact, will work here beautifully, including the leafy ones like spinach or kale! Do I need to make dumplings? Of course you don’t! 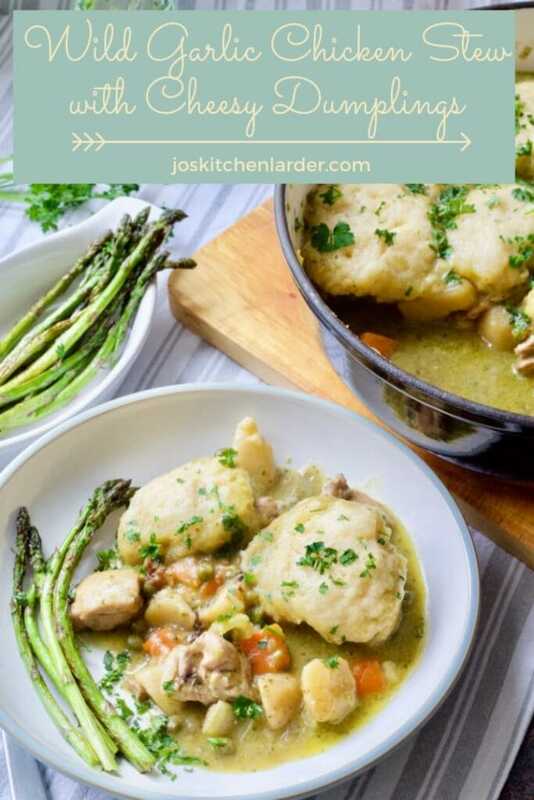 You can make this lovely chicken stew without them and save yourself on some calories but I would encourage you to try the dumplings as they really are super delicious and make this simple chicken stew a proper comfort food dish! 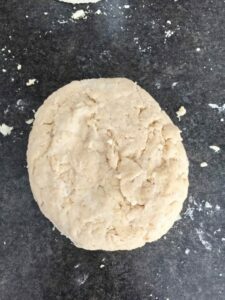 You can make your dumplings in advance and pop them either on a large plate or in a container sprinkled with some flour. Make sure you cover them well to prevent them from drying and pop in the fridge until you are ready to use them. I would suggest to take them out of the fridge approx. 30 minutes before they go in your stew so they have a chance to come to room temperature and cook nice and even. This stew reheats really well if you have any leftovers. Once cooled, simply pop your leftovers in the fridge for up to 2 days. Reheat gently in the microwave or on the hob/stovetop. 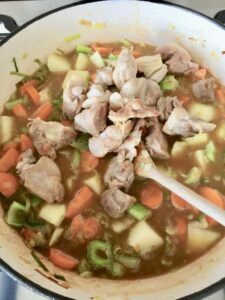 This chicken stew can be frozen in freezer safe container for up to 6 months. 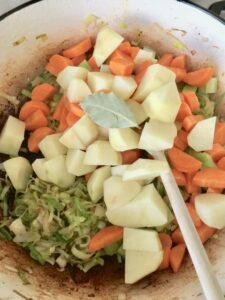 If you’d like to freeze it I would recommend to do it without dumplings and prepare fresh ones once you’ve defrosted your stew as frozen dumplings lose their lovely fluffy texture. 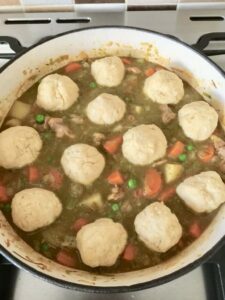 Defrost your stew in the fridge overnight and reheat on the hob/stovetop with freshly made dumplings as per recipe below. You might want to consider making your own chicken stock to use here. It really couldn’t be easier and you can have a nice stash in your freezer to take out and use whenever you need. 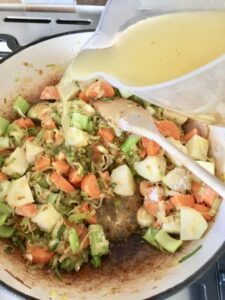 Check out my guide on How To Make Chicken Stock in Instant Pot (with instructions for hob/stovetop users too)! Heat a glug of oil in a heavy duty casserole dish with the lid and sautée chicken thighs seasoned with some salt and pepper for approx. 5 min until they start to brown. 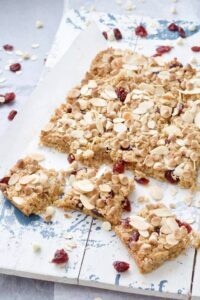 Take them out of the dish with slotted spoon and set aside. Melt butter in the same dish and sautée prepared onions and leeks until they start to soften approx. 5 min. Add remaining vegetables and bay leaf and sautée for another 5 min. Sprinkle over the flour, pour in stock and give it all a good stir. Add chicken pieces making sure they are immersed in the liquid, bring everything to boil, reduce the heat and simmer for 15 min. whilst you prepare your dumplings. 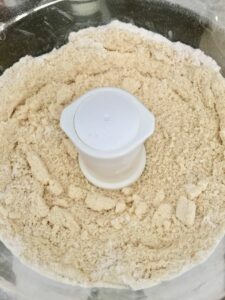 For dumplings mix flour and butter in the food processor or by hand until they resemble breadcrumbs. 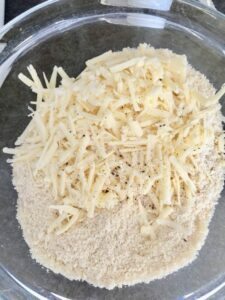 Mix in grated cheese and season with some salt and pepper. Slowly pour in icy cold water and keep mixing your dough only until it comes together (you don’t want to overmix it). Divide the dough into 12 equal size balls and set aside until needed. After 15 minutes of simmering, add pesto and frozen peas to your casserole and mix well. Place dumplings on top, cover tightly with a lid and simmer for approx. 20-25 min until cooked. Prepare all the vegetables as per instructions above. 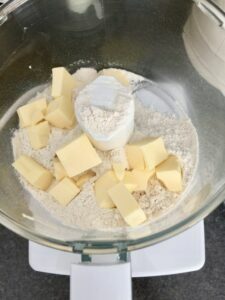 For dumplings mix flour and butter in the food processor or by hand until they resemble breadcrumbs. 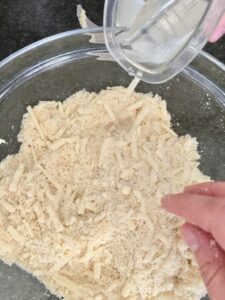 Mix in grated cheese and season with some salt and pepper. Slowly pour in icy cold water and keep mixing your dough only until it comes together (you don't want to overmix it). 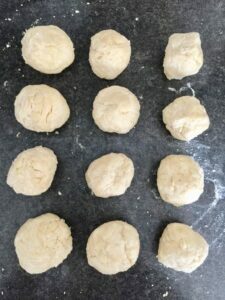 Divide the dough into 12 equal size balls and set aside until needed. After 15 minutes of simmering, add pesto and frozen peas to your casserole and mix well. Place dumplings on top, cover tightly with a lid and simmer for approx. 20-25 min until cooked. Serve sprinkled with fresh parsley and roasted asparagus or any other seasonal veg. Enjoy! If you don't have wild garlic pesto you can use any green pesto you've got on hand, store bought one is fine too. Leftovers can be kept in the fridge for up to 2 days. Chicken stew can be frozen without dumplings for up to 6 months. Dumplings are best prepared fresh after defrosting. 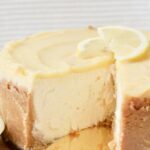 Update Notes: This post was originally published on 22 May 2018 and republished in March 2019 with some step-by-step photo, updated recipe card and some useful info. 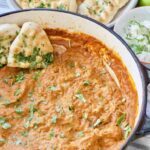 Some more comfort food recipes you might enjoy! Have you tried my Wild Garlic Chicken Stew with Cheesy Dumplings? Leave a comment at the bottom of this post, I love reading them! 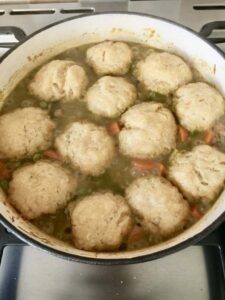 Pin Wild Garlic Chicken Stew with Cheesy Dumplings For Later! I need to find some wild garlic to try! This looks like such a fresh and tasty stew for this time of year. Thanks Cat! It really is such a delicious spring stew! This casserole looks so rich and creamy. Sounds like a great comfort food! I’ve never had the pleasure of working with wild garlic — I never see it in our markets here in South Florida. I need to find a source for it, because this looks like such a warm, hearty dish. It’s gonna be a family fave for sure! Thank you Lisa! 🙂 Wild garlic is quite popular in the UK in the early Spring. It’s a great thing to go forage for although I get mine in my weekly organic veg box. It’s much milder in flavour than regular garlic although still packs a pungent punch 🙂 Pesto made with it goes so lovely here! Cheesy dumplings, yes please. I also love how you added pesto. I have some pesto in the fridge that needs to be used so I’m adding this to our menu for next week. Thanks for sharing! Thanks! Pesto really comes through in this stew! I hope you like it! 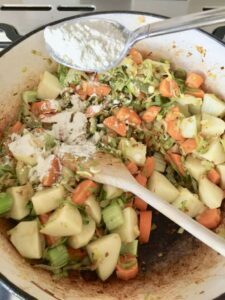 This casserole is everything I imagined for this weather we are having right now! It looks delicious as well. Thanks for sharing! This casserole looks so comforting and delicious! 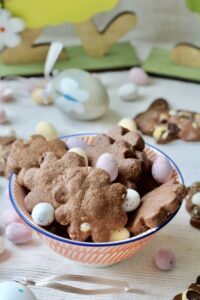 Can’t wait to try this recipe soon! Wow, this looks amazing! And, cheesy dumplings..yum! Thank you for sharing at Fiesta Friday! Chicken and dumplings is one of my all-time favorite comfort food dishes! 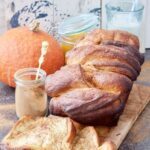 The fact that you’ve recreated it here using seasonal ingredients has practically rocked me to my core. I can practically TASTE this!